SwiftStack provides several middleware options, which can be enabled in the SwiftStack Controller console. Once enabled, the selected middleware will be installed and set up in your SwiftStack cluster next time you Deploy Config. The lowest Swift version running in your cluster determines which middlewares are available. We always recommend you run the latest version of Swift. 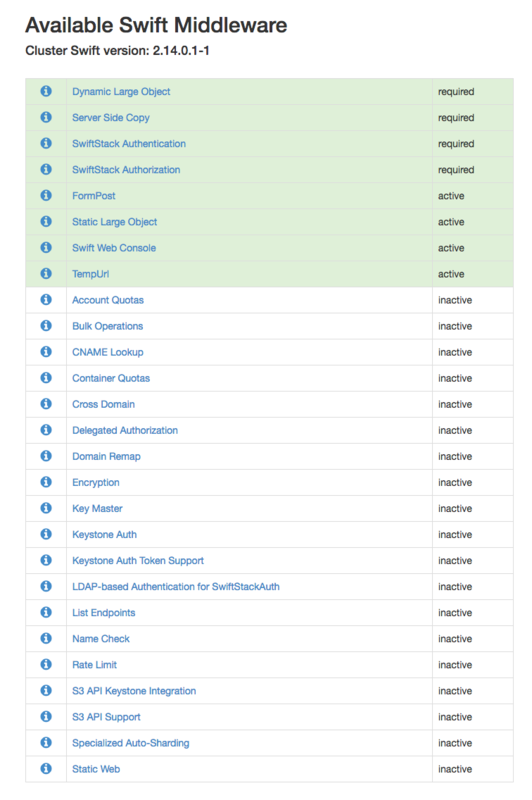 SwiftStack Auth Always on, a fast flat-file is deployed on each node to authenticate users using hashed passwords. Encryption Middleware Encryption middleware must be deployed in conjunction with the Keymaster middleware. Implements middleware for object encryption. Keymaster Middleware Keymaster middleware must be deployed in conjunction with the Encryption middleware. Implements key management for object encryption. KMIP Keymaster Middleware KMIP Keymaster middleware must be deployed in conjunction with the Encryption middleware. Implements key management for object encryption using and external KMS server. FormPost Translates a browser form post into a regular Swift object PUT. Keystone Auth Required for Keystone Authentication/Authorization (along with the "Keystone Auth Token Support" middleware). Keystone Auth Token Required for Keystone Authentication/Authorization (along with the "Keystone Auth" middleware). LDAP-based Authentication for SwiftStackAuth An extension to SwiftStack Auth which allows organizations to authenticate users against their internal LDAP based on individual or group membership. Name Check A filter that disallows any paths that contain defined forbidden characters or that exceed a defined length. Rate Limit Limit the number of write operations (PUT, DELETE) to an account. Static Web Web Server Gateway Interface (WSGI) middleware which serves container data as a static web site with index file and error file resolution and optional file listings. Static Web can be used both for anonymous and authenticated requests. S3 API Support Access SwiftStack via the Amazon S3 API. TempURL Allows URLs to be created to provide temporary access to objects. This may be handy when needing to provide download link for large objects from a Swift account which does not have public access. Delegated Authorization Allows an external Permit webservice to disallow certain requests based on opaque headers provided by Swift clients.